The dates for the 2 diets of exit interviews have been confirmed to take place on 10 to 14 September 2018, and 18 to 22 March 2019. The dates for 2018 exit interviews have been confirmed to take place on 10 to 14 September 2018. The dates for the 2 diets of exit interviews have been confirmed to take place on 13 to 20 September 2017, and 21 to 28 March 2018. The College of Dental Surgeons, Singapore is pleased to invite you to a lecture titled “Antithrombotics and Dentistry – The Clot Thickens”. The lecture is organized by the College of Dental Surgeons, Singapore and the speaker of the event is Dr Winston Tan, Chair of the Chapter of Oral and Maxillofacial Surgeons. Please click here to watch a video by the speaker, Dr Winston Tan. The College of Dental Surgeons, Singapore (CDSS) together with the College of Dental Surgeons, Hong Kong and the Royal Australasian College of Dental Surgeons organised the 2nd Joint Collegiate Scientific Meeting 2016 (2nd JCSM) from 9 July 2016 to 10 July 2016 at the Grand Copthorne Waterfront Hotel Singapore. The 2nd JCSM organising committee was chaired by Dr Benjamin Long (Chairman) with assistance from Dr Henry Ho (Co-Chair). 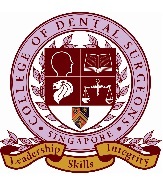 The organising committee had the full support of the College of Dental Surgeons, Singapore. The dates for the 2 diets of exit interviews have been confirmed to take place on 8-12 August 2016 and 9-13 January 2017. The College held its 6th Conferment Ceremony and CDSS Guest Oration 2015 on 20 April 2015 at the Amara Hotel Singapore. Professor Teo Eng Kiong, Assistant Master, Academic Affairs of the Academy conferred the Fellowship certificate and a collar pin bearing the College’s logo to 10 Fellows of the College. The College was privileged to have Dr Tan Lai Yong as the CDSS Guest Orator. The dates for the 2 diets of exit interviews have been confirmed to take place on 14 to 16 September 2015, and 21 to 23 March 2016. The College of Dental Surgeons, Singapore (CDSS), organised an appreciation dinner to thank the Chairs and Members of the DSAC (Dental Specialist Accreditation Committee) for their hard work and dedicated service on the 23rd of January 2015 at the Furama Riverfront Hotel. The DSAC Chairs and Members served in the period from March 2012 to April 2015. The DSAC was led by Dr Bryce Lee, Chairman, Joint Committee Dental Specialist Accreditation (JCDSA). The briefing will include a presentation on how to apply to sit for the assessment and the steps involved in accrediting a candidate as a dental specialist including the assessment process. This will be followed by a question and answer session. Light refreshments will be provided. The briefing is free for all registrants. Please inform Ms Shermaine Tan at shermaine_tan@ams.edu.sg if you wish to register for the briefing for catering purposes. You can download a pdf copy of this announcement by clicking on the link here. CDSS is participating in the first Joint Collegiate Scientific Meeting in Hong Kong on 7th and 8th December 2014. This inaugural collaborative scientific meeting is an initiative of the three organizing Colleges to support Fellows and Members of the Colleges in continuing professional development through joint scientific meetings and to advance and promote dentistry to the profession and the communities in the Region. This joint scientific meeting features two internationally renowned speakers, Professor Ken Hargreaves from the United States and Dr. Paul Sambrook from Australia, together with a number of invited eminent speakers from Singapore and Hong Kong, presenting a wide spectrum of interesting topics including endodontics, oral and maxillofacial surgery, pain management, prosthodontics, implantology and paediatric dentistry etc. You can find more information at the website at http://events.swiretravel.com/jcsm2014. Attached also is the manual registration form for your reference. Click here to download the manual registration form. If you are planning to attend, please return the completed registration form with payment to the registration secretariat listed in the registration form. The dates for the 2 diets of exit interviews have been confirmed to take place on 22 - 24 September 2014, and 23 - 25 March 2015. The College of Dental Surgeons, Singapore, in collaboration with the College of General Dental Practitioners, Singapore, has put together the Best Practice Manual based on an initiative from the Ministry of Health, Singapore. The purpose of this manual is to provide dentists with a set of professional guidelines to some of the commonly used TOSP codes in dental clinics. Please click here to view the Best Practice Manual. The link to the attached Excel file can be found in Page 3 of the Best Practice Manual. The College of Dental Surgeons is proud to present a full-day symposium on 24 August 2013. The College’s sub-theme will be ‘Advancing Together in Clinical Dentistry’. The College of Dental Surgeons, Singapore had formed a workgroup comprising representatives from the College of Dental Surgeons, Singapore, the College of Surgeons, Singapore, the Chapter of Infectious Disease Physicians and the Chapter of Gastroenterologists, both Chapters of the College of Physicians, Singapore to publish a position paper on the management of health care workers with blood borne diseases to the Singapore Dental Council.